Who can deliver a better professional service than a services’ based company ! With the accelerated technology advances, the complexity of IT projects’ technicality is increasing by the day. Relying on the in-house resources to implement a solution or even the equipment providers to perform the complex implementation can lead to a lot of redo’s and prolonged implementation time. Engaging a professional Services Provider will not only provide an unbiased advisor but will ensure the project technicalities are well implemented and adopted by the in-house team. ADVISORY with Services as part of its core expertise offers professional services to its clients. We are distinguished for caring about quality and ability to employ the best resources, tools, and technique when it comes to technical design and/ or implementations. Out professional Services offerings can be leveraged whether ADVISORY has been providing the solution products or not, we can always be engaged to perform the major tasks required during a solution realization. We follow a PDIOO methodology [ Plan. Design. Implement. 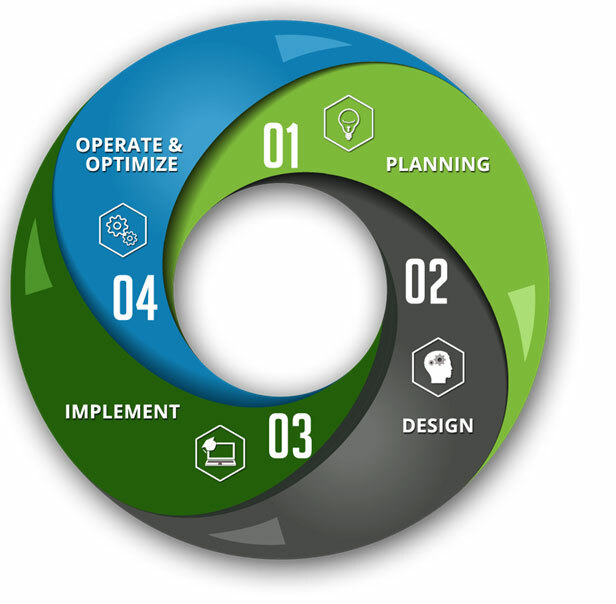 Operate and Optimize] through our professional services engagements, we apply strict quality measures during each phase which ensures an end-to-end properly implemented solution. Our qualified resources whether technical designers, technical implementers or project managers work closely together to realize the targeted solution with the highest quality. While we recommend engaging ADVISORY through the whole lifecycle of a technical project, we can offer sliced services from the whole offering. During the planning phase, all project technical requirements are gathered and classified. The planning phase caters for a base for all information required through all upcoming phase. Especially the design and the implementation. Design phase takes into consideration all solution provided through the planning phase. During the design phase, the technical documentation are generated. During the Implementation phase, ADVISORY qualified implementation engineers apply implementation plan document and perform all required implementation tasks from equipment staking to configuration. All quality procedures are strictly followed. ADVISORY offers to operate the final solution after implementation as a managed service to its clients. During the operate phase, ADVISORY not only operate, but optimize the design and the overall solution as required.